Remember these leaves from last year that Gigi sent us from France? I realized I never posted what we did with them because we didn't fully complete the project until last week. So most of these pictures are from last year with a new addition at the end. 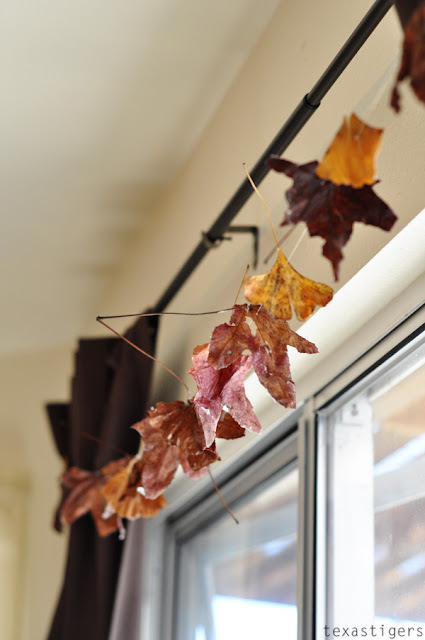 We turned them into a wonderful fall craft project. My mom sent me this link and I knew that I wanted to do that project. Only problem was that the leaves here weren't that pretty. So we got surprised with some lovely French leaves that work much better. The instructions in the blog post said melt the wax over a burner but the Gulf Wax box says to melt it using a double boiler method so we went that way. It may work the other way but I was too nervous to try that. I didn't want to ruin a pot with wax or spend forever trying to clean the wax out of my pot. We dipped the leaves into the wax and laid them on wax paper to dry. Abby really enjoyed this project and it was really easy to do. Just really watch and be careful because the wax is hot! Keep little fingers away from the wax - Abby did the ones with really long stems and I did the ones with short stems. This would not be a project I'd want to attempt with Micah around since he loves to help so much. Can you spot the Texas leaves that are mingling in there with the French leaves? Shouldn't be too hard to spot the odd balls! Now what's the point of this little project? You know other than just to have fun and do a project? I finally figured out a good way to hang them this year. I used a needle to 'sew' some thread through the leaves. Last year I was stumped as to how to hang them so I never ended up hanging them up. I saved them though and most of them lasted until this year but I'm sure they would have been a little prettier last year.